Yay!! Another girlie in my team celebrates her special day this time of the year. Today is Carole's Birthday. Happy Birthday my love. Carole is a sweetheart, we become good friends since she joined my team and I just love her calm way and also admire her card making style. I am sure you've visited her before, but if you haven't stop by her blog and admire the beautiful projects she makes. Here's the card I have made and sent her. Queue Up new level 3 hostess set again and what a cutie this set is. I love those birdies in full song and I have imagined that they are signing happy birthday to Carole. 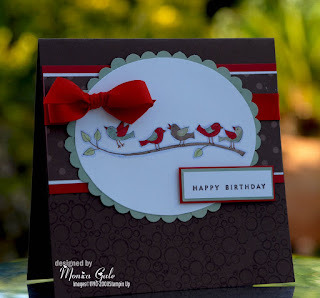 Oh beautiful card Monica I'm sure Carole will just love it, adore the colour scheme it's fab and love the way you have coloured the bird stamp! love this card looove the birdies Fab. Thank you Monica for my beautiful card. It is georgous, love it. Beautiful card Monica! I love your design....tfs!!! Stunning creation Monica, love it. Great color combo and love the circles! Beautiful Monica! Color combo is fab as well!